LIKE THIS POST IF YOU READ FAIRY TALES! Talk about Psychological-slash-Literature parodies, the title screams Oedipus and Electra complex! If you love people watching, you're bound to fall hook line and sinker just with the title--don't even get me started with the cover art. One thing you should know about me, I love fairy tales. In fact, to graduate college my thesis is all about fairy tales! I guess I enjoyed doing my thesis because I had to drown myself with literature about fairy tales THEN move forward by discussing and seeing how little kids react/understand fairy tales. So... when I saw this anthology and was wowed by the "special appearance" of Gregory Maguire, hello Wicked, I saw no reason not to pick up the book and fill myself with magic. Warning: This isn't the fairy tale bunch to put yourself or your tykes to sleep with. If you share my impatience, begin your fairy venture by downing Neil Labute's Kismet (filled with heavy sardonic bitterness) and Lydia Millet's Snow White Rose Red. 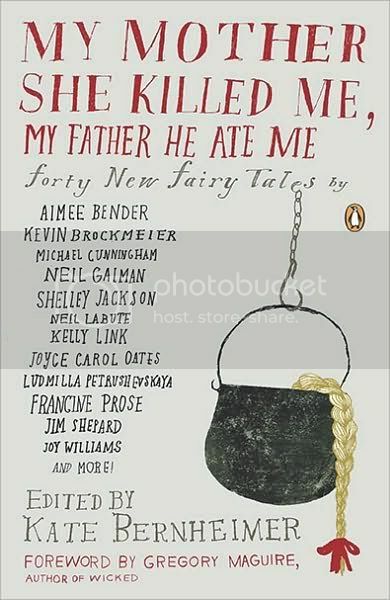 My Mother She Killed Me My Father He Ate Me is available at Fully Booked. Follow them on Twitter. I think I might pick this up. It sounds so interesting! I wonder, in what section can I find this in? Oh I forgot haha But at Fully Booked The Fort it's at 2nd floor, deep left side.